Will the Next Charlottesville be Here? Candidates for public office frequently state that they learn the most about local issues by talking with their voters. This may sound like a cliche, but in fact I recently learned about virulent anti-Semitism and racism lurking right in our backyard, by talking with voters who have been exposed to such hatred. Together with my running mate Wendy Rothstein, I am a Democratic candidate for Judge of the Court of Common Pleas of Montgomery County — the main county court located in Norristown. As a candidate, I have traveled the length and breadth of Montgomery County, a large and diverse district, from my home in Lower Merion to close-by communities in Cheltenham and Abington, to the more rural areas farther north. Wherever I go, I have spoken of the lessons that we have learned this year about the importance of judges in protecting individual rights and in standing up to government abuse of power. Ever since August 12, I mention the march of neo-Nazis and Klansmen in Charlottesville, which for me was a blaring wake-up call. The Charlottesville march was sickening and terrifying. And the most frightening part was that we know that we have not seen the last of these hate groups — especially with the encouragement provided by Donald Trump’s message of moral equivalency. As I have addressed groups around the county, I have asked the question, “What if the next march is here?” Free speech is constitutionally protected, but violence and intimidation are not. Who do you want sitting in the courthouse if the marchers come here and bring these legal issues with them? Audiences seemed responsive. But in truth, I wondered whether my questions were just abstract and hypothetical. That was until I went to the Perkiomen Valley, in the northern reaches of Montgomery County, encompassing towns like Schwenksville, Red Hill, and Pennsburg. To a group of voters, I posed my usual question — “What would happen if the Klan were to come here?” — but the reaction was very different. They laughed. My question was a foolish one. As the audience explained, “The Klan is already here.” They told me how Klan members have lived in the community for years, including the man in their neighborhood who stands in public places dressed in a Nazi-style brownshirt. The Klan has typically been quiet, but recently, I was told, they have become more vocal. “They feel they have permission now,” one voter said. Voters in the town of East Greenville showed me flyers that they had received in the mail, anonymously, before the Charlottesville march. I will not describe them in detail, because they were so offensive that I refuse to repeat their content. Let me just say that they were the most vile anti-Semitic and racist materials that I have ever seen. It was as if they had been taken right off the wall of the Holocaust Memorial Museum in Washington. They were appalling. I could only imagine the fear that was evoked when everyone in the neighborhood opened their mail that afternoon. My experience with the voters of the Perkiomen Valley drove home the point that questions about where the next Charlottesville will occur are not just hypothetical. The hate groups are already here. More of them may be coming. We need to be ready, so that violence and intimidation do not threaten our democratic values and individual rights. Jeffrey Saltz lives in Lower Merion and is a Democratic candidate for the Montgomery County Court of Common Pleas. He is a past President of Beth David Reform Congregation in Gladwyne. More information is available at www.saltzforjudge.com. Supreme Court Stays Court-Ordered Texas Redistricting. What Does It Mean? Original gerrymander cartoon by Elkanah Tisdale, “Boston Gazette,” March 26, 1812. The case challenging redistricting in Texas, Veasey v. Abbott, has been around since 2011. Congressional districts set after the 2010 census were alleged to be discriminatory against minorities and hence illegal under the federal Voting Rights Act. Plaintiffs won, and new districts were drawn and approved by the federal district court. The High Holy Days are an opportunity for reflection and introspection. As the leaders of major denominations in American Jewish life, we have been deeply engaged in both, considering the events of the Jewish year that is ending and preparing spiritually for the year to come. 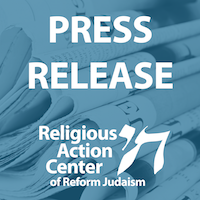 In so doing, we have thoughtfully and prayerfully considered whether to continue the practice in recent years of playing key roles in organizing a conference call for the President of the United States to bring High Holiday greetings to American rabbis. We have concluded that President Trump’s statements during and after the tragic events in Charlottesville are so lacking in moral leadership and empathy for the victims of racial and religious hatred that we cannot organize such a call this year. The High Holy Days are a season of t’shuva for us all, an opportunity for each of us to examine our own words and deeds through the lens of America’s ongoing struggle with racism. Our tradition teaches us that humanity is fallible yet also capable of change. We pray that President Trump will recognize and remedy the grave error he has made in abetting the voices of hatred. We pray that those who traffic in anti-Semitism, racism, and xenophobia will see that there is no place for such pernicious philosophies in a civilized society. And we pray that 5778 will be a year of peace for all. I, like so many, am weeping at the words I heard yesterday from the leader of our beloved country. Moreover, I am wondering if any of the president’s supporters who have any shred of moral credibility left are looking at themselves in the mirror and asking, “What have I done?” And when will other members of that coterie of his inner circle show some backbone and call out, loudly and clearly, the heinous words and actions that have tarnished this presidency? This is the time to be an “upstander” and not a “bystander” in our daily interactions as well. Our children, whose footsteps are shaping the path of our nation’s history, are listening. This is the time to remember and honor all those who have stood up and fought against Nazism, Fascism and global genocides at any level. White nationalists marching in Charlottesville. Photo: All InOne News video. This is the time to remember the diminishing number of Holocaust survivors who are the heroic remnants of the horror inflicted by racial and ethnic hatred. This is the time to feel empathy for the African Americans who still feel the inequalities, for the moderate Muslims who feel threatened, and for the undocumented, law-abiding immigrants who want a fair opportunity and path to citizenship. So, as a human being, as the daughter of an immigrant, as an American Jewish woman, as a mother, as a grandmother and as a Holocaust educator, I will continue to speak my mind. Deanne Scherlis Comer is past chair of Abington School District’s Holocaust Curriculum Committee and is an education consultant for the Holocaust Awareness Museum and Education Center of Delaware Valley. Sen. Susan Collins (R-ME) deplaning in Maine to applause after voting against the repeal of the ACA. Photo: BLCKDGRD’s Twitter Page. Indeed, a willingness to listen to bipartisan solutions is long overdue. We need to build on the gains in insurance coverage we have already seen by repairing the holes in the ACA. In my mind, the best and simplest way to accomplish that is a single-payer solution, i.e., “Medicare for all.” This would cover everybody’s basic health care needs and allow private insurance to specialize in supplemental insurance if people so choose. Anti-Semitic definition at Ryerson University. Ryerson University’s Ryerson Students’ Union (RSU) has officially adopted and printed the Canadian definition of anti-Semitism. The implementation of an anti-Semitism definition at the Toronto university may encourage other schools and universities to follow suit. The Blessing of Separating Church and State: Is It at Risk? Why would we want to separate church and state? Isn’t religion a positive force in society? Doesn’t it foster ethical behavior and encourage charity? Just think of all the church-run soup kitchens or the moral leadership provided by the Rev. Martin Luther King Jr. So why would the framers build a wall separating church and state? Why not unite the two and combine their power for good? What were the framers thinking? Were they opposed to religion? Were they at war with Christmas? Certainly not. Most were religious themselves.